In recent years Germany’s capital has been changing fast. Flats that once were unattractive are now being exploited as financial investments, leading to massive rent hikes and the transfer of rental flats to owner-occupation. Visible tenant protests are a reaction to the growing shortage of affordable housing. 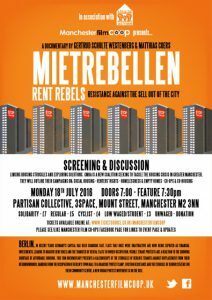 This 78m documentary presents a kaleidoscope of the struggles of Berlin’s tenants against displacement from their neighbourhoods. Ranging from the occupation of Berlin’s Town Hall to a roadside protest camp, eviction resistance and the struggle of senior citizens for their community centre, a new urban protest movement is on the rise. Housing inequality mirrors inequality in UK society also. Last year, rough sleeping rose by 30% and the number of households in temporary accommodation rose by 12%. Meanwhile house prices rose by 7.9% to a national average of £262,000. The gulf is widening and our most vulnerable are falling through the cracks. 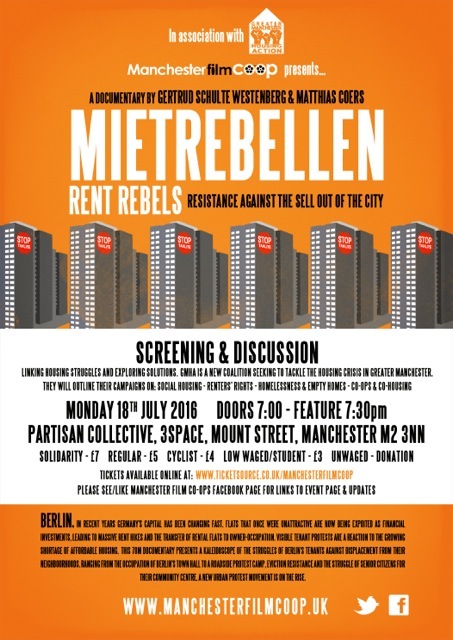 Greater Manchester Housing Action (GMHA) is a new campaigning coalition seeking to tackle the housing crisis in Greater Manchester through radical and alternative solutions. We want to pressure local and national government to change policies on social housing, and also look at ways in which people can work together to meet their own housing needs, through models such as co-operatives. Againt the odds, we want to ensure that the provision of decent, affordable housing is a fundamental element of the GM Devoluton deal.